Imagine you’ve worked hard your whole life. You’ve gotten the degrees, perhaps even multiple degrees, you got the job, worked your way up the ladder to a corner office, you drive a nice car, have a big beautiful house, some kids and spouse…yup – here you are. You might be a bit grayer than expected, little stressed or even a bit burned out – but hey! You made it! So why doesn’t it make you happy? Why do you often feel like this can’t be all there is, that some thing is missing but you don’t have any idea what it is? Why don’t you FEEL good? Your parents tell you what a success you are – heck they probably tell everyone what a success you are. Your spouse is pleased with the level of success you’ve achieved and your kids are well taken care of. So, you’ve got the kids, the car, the house and the damn white picket fence. By all accounts you are a freaking SUCCESS! So what gives? Why don’t you FEEL it? Well, there may be one, small, minor thing you forgot to take into account actually. It’s that whole bit about ‘What actually matters to you?’ that often gets overlooked. Let’s back this success train up a bit and see just how we actually got here. You see, we are fed early on a diet of what the stereotypical meaning of success is and even a general expectation of how one should get there. You know the drill – graduate high school, go to college, career, marriage, house, kids, promotions, corner office til you retire and then you can enjoy your life! Sounds delicious when it’s put that way right? Well, it might – to some people. But to a lot of people there is a certain amount of recoil that happens. It’s interesting that when these expectations are taken out of the context of ‘everybody know’ and the movies and all that we are given to become conditioned to it…lots of people are not really fans of this. In fact, a LOT of people really don’t want to keep up with the Jones. I know…I am one. It used to drive a few friends of mine quite around the bend (no pun intended) that I was quite content with a 12 year old car as long as it feels safe and reliable. It was a lovely red actually and quite comfortable and fun to drive. But they had gotten the idea that success means a new car every couple of years, and leasing was the way to go. No judgment if it works for you, but I couldn’t see the point of perpetual payments and the hassles of new car buying every few years. I have another lovely friend who walks dogs for a living. She makes enough to cover her needs and little more – but not much more. But you know what? She’s got to be the happiest, most content person I’ve ever met. She also has a Master’s degree in business. Working in an office, for a ‘boss’, at a desk would probably kill her spirit. Growing her own business bigger in order to make more money and expand is not something she is interested in…like at ALL. She loves her life. And I know it’s hard for many to understand that playing a bigger game is not what she is here for. Her game is plenty big for her. Her desires are not the corporate office, the big house or fancy cars. Not even close. I know she gave up a lot of material goods, sold her home, frustrated her parents and lost some friends because she was brave enough to be truthful about what was truly important to her. It makes lots of people uncomfortable. It’s disconcerting for those who are living someone else’s expectations to watch someone life the life they want regardless of what others think. And this is true even when we are not yet aware of what we are doing. Our spirit knows, our hearts know, even when our logical mind is still unaware of the issue. The really heartbreaking part of all of this lies though in the breakdowns, the burn outs, the self-imposed judgments and how we beat ourselves up if we do not meet this standards that we never agreed to in the first place. The flashy lifestyle may not be what you are here for, what you’re built to love, just as some are not meant for the quite backwoods, farm life. It’s really time we step back and realize that this standardized look at what we all ‘must’ want is killing us, killing our planet (oh right, materialism!) and making unhappiness, anger and stress the norm. It is NOT our normal state of being. So lovelies, what really does bring you joy? Real joy…not that momentary fix you get when you buy something new or make another dollar an hour. That’s what you need to focus on. If it’s your career, great! Go after it. No need to create a family you resent and feel obligated to! And if family is what brings you joy, maybe you need to think about downsizing so you can actually spend that quality time with them. There are just as many ways to reach those things that bring you joy as there are joys to be had. But please, stop living someone else’s plan. Society can shove off…do YOUR thing and make the world a better, more joy-filled place. Define what success is going to look like for YOU. What holds real meaning for you? Without the boundaries and expectations. Success for me looks like time, freedom to write, a backyard retirement for Charlie and *ahem – new puppy friends, and the space to grow into more of me. Connection, community, support, love…these are what bring me real joy. It’s my thinking that we ought to define what success is going to feel like first. 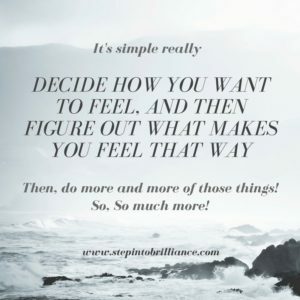 Then do more of that which makes you feel that way…so so much more of that! I love where you say that the flashy lifestyle might not be for you. It seems like we only get the opposite message and end up working ourselves to death for something we don’t actually want and we don’t even know it. It’s really sad! Now I’m thinking about what it is I really do want!